Did you arrive on this page expecting to read more on Personal Branding? You can find the article here: Tips to Build Your Personal Brand. Sorry for the confusion! When it comes to PR and marketing, knowing what your customers think about you and what motivates them is a great starting point. Businesses often make the mistake of assuming they know what makes their target audiences tick. They end up spending big bucks on mistargeted marketing campaigns that do not resonate with those they are trying to influence. The only way to really know what your customers are thinking and feeling is to ask them. A focus group is a gathering of a small group of people representing your target audiences that take part in a guided discussion led by a moderator. They are asked a short series of questions that can be related to a product, service, brand or campaign. The group dynamic encourages a much more lively, in-depth discussion than one-on-one interviews and a much deeper dive into what is appealing and what is not than a survey. I didn’t fully understand the value of research until I studied for and earned my accreditation in public relations from the Public Relations Society of America in 2016. Anyone who has been through this rigorous process knows the foundation of good public relations is research. There are 19 research methodologies, each designed to garner specific information about your audiences. Focus groups are beneficial for quickly getting information, qualitative data that allows your organization to observe key messages, perceptions or completely new information from the audience in the focus group. I hosted a focus group shortly after earning my APR for an organization considering a name change. In the focus group, its members overwhelmingly felt the organization’s name wasn’t indicative of what the organization does. The valuable research was shared with the client and it eventually led to a name change that has increased the name recognition and value of the organization today. Without the “proof” from the focus group, the organization would have likely continued using the same name and missed the opportunity to rebrand. Focus groups are a qualitative approach to research as opposed to a quantitative approach. Quantitative research involves the collection and analysis of hard facts and figures like web traffic stats and sales earnings. Qualitative research helps us understand how and why people do what they do. You can host an informal focus group in-house, gathering a group of clients, employees or other stakeholders to discuss proposed changes to your logo, upgrades to your website, or what they would like to see changed about your company. Alternatively, you can hire a trained professional to moderate your focus group. This is a service most research firms and some PR agencies, including Marshall Communications, offer. Start by defining the purpose and desired outcomes. Keep the group small. Limit it to no more than eight to 10 people. Hold the focus group in a neutral location. If the group will consist of employees, we recommend hosting the session off site, away from work. Choose a neutral moderator, someone not attached to the subject and not known by the participants. Using a team member as a moderator may prevent some people from openly sharing their opinions. Limit the discussion to one hour or an hour and a half; any longer and people will lose interest and focus. Work with a list of no more than five pre-determined questions and decide in advance how much time will be spent on each. This will give you time to get thorough group input on each subject you plan to cover. Serve refreshments. We generally provide beverages and an assortment of sandwiches. When people are hungry, it is hard for them to concentrate. Make sure the moderator keeps the conversation on track. They need to be skilled at reeling in chats that get off topic and making sure no one person dominates the discussion. Offer an incentive to encourage people to participate. Cash or a gift card in the amount of $50 – $100 is standard. Tape or videotape the focus group, in addition to assigning someone the task of taking notes. They will be helpful tools when you craft the report summarizing your findings. 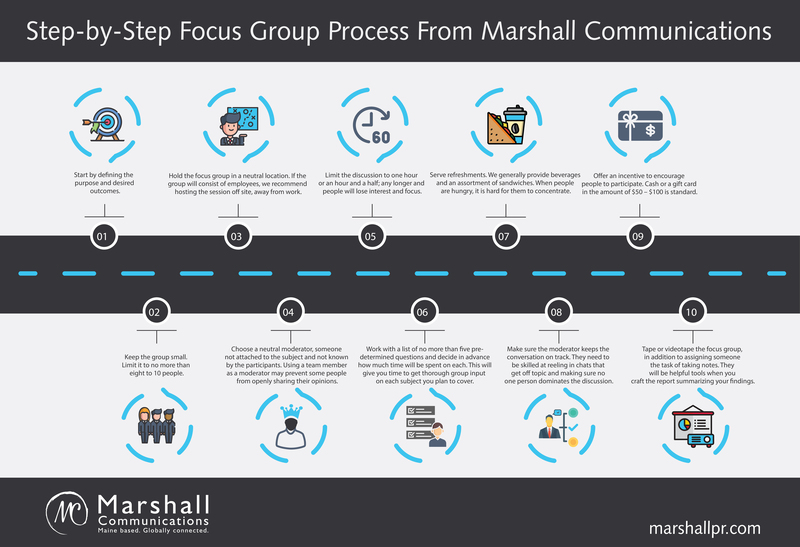 At Marshall Communications, we recommend research as the first step in the development of our Marshall Plans®, customized three-year public relations and marketing plans tailored to the individual goals and vision of each client. If you’re interested in more information about a Marshall Plan®, visit www.marshallpr.com/the-marshall-plan. The intelligence we gather from our research drives the direction of the plan. Focus groups are our approach of choice because we often learn things we would have missed had it not been for the input of focus group members. Focus group research is worth the investment. It provides a direct line of communication to those you want to influence. Companies that don’t listen to their customers struggle with engagement and brand loyalty. Ultimately, this impacts the bottom line.